(October 14, 2016) The November ballot includes candidates for various offices within districts that split Mecklenburg County and Steele Creek. These are United States House of Representatives, North Carolina Senate, North Carolina House of Representatives, and Mecklenburg Board of County Commissioners. Below are maps of the districts and lists of candidates. The November ballot also includes candidates for various national and statewide offices, North Carolina Supreme Court, Appeals Court, and District Court judge seats, and Soil and Water Conservation District Supervisor. Charlotte voters also will vote on three bond issues. Go to Mecklenburg County Address Search to view your sample ballot. See also A-Z Guide to Voting for Mecklenburg County for more information about the candidates. Early Voting starts on October 20 and extends through November 5. See Steele Creek Early Voting Site Moves to York Ridge Shopping Center. Election Day is Tuesday, November 8. 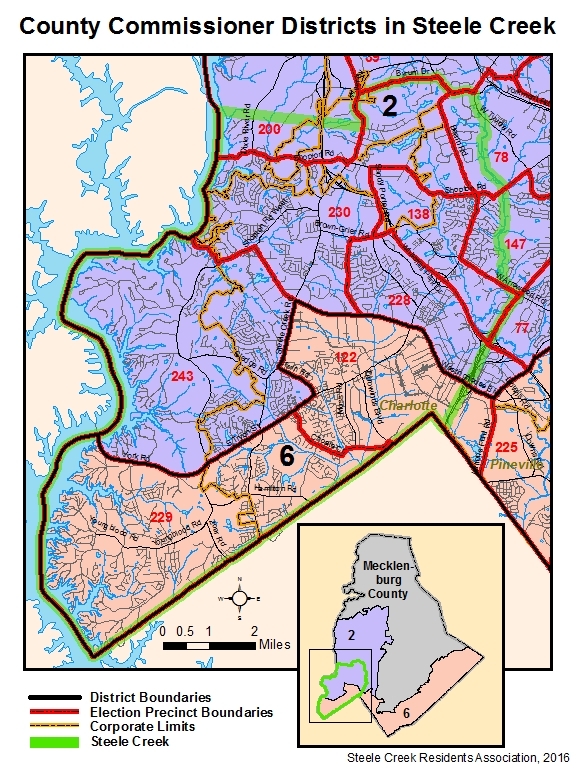 Steele Creek currently is split between Congressional Districts 9 and 12, but the Federal Courts ruled that North Carolina's Congressional Districts were unconstitutional and required them to be redrawn for the 2016 Election. 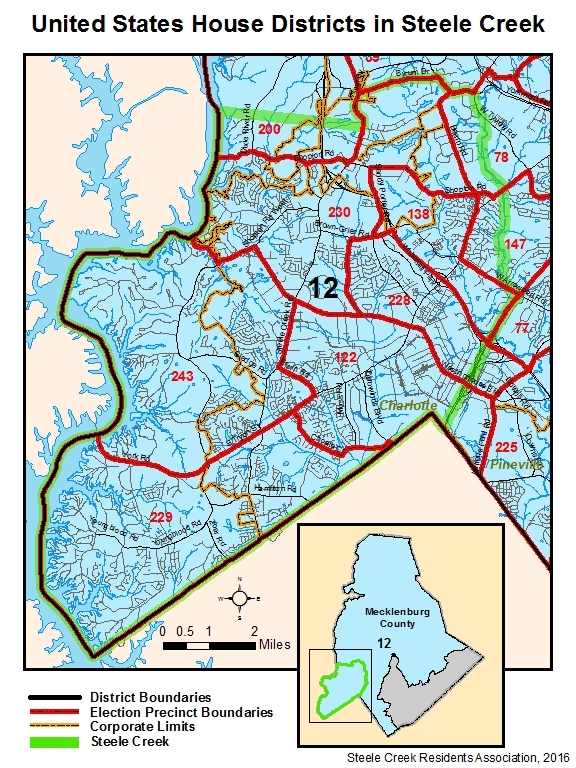 Steele Creek is entirely within new Congressional District 12, which will be used for the 2016 Election and take effect with the 115th Congress in January 2017. 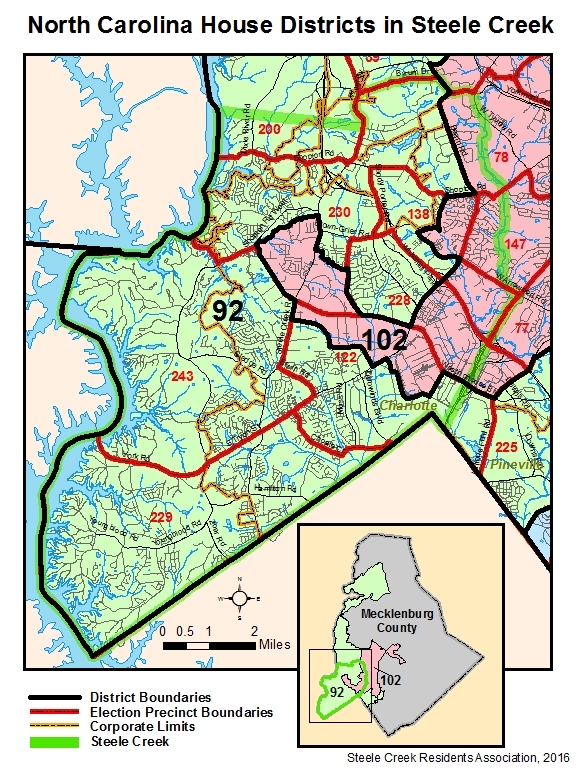 New Congressional District 12 is entirely within Mecklenburg County. Most of Steele Creek is within Senate District 37, but the northeast edges are within District 38. Federal Courts have ruled the North Carolina Senate Districts unconstitutional, and they must be redrawn for the 2018 Election. 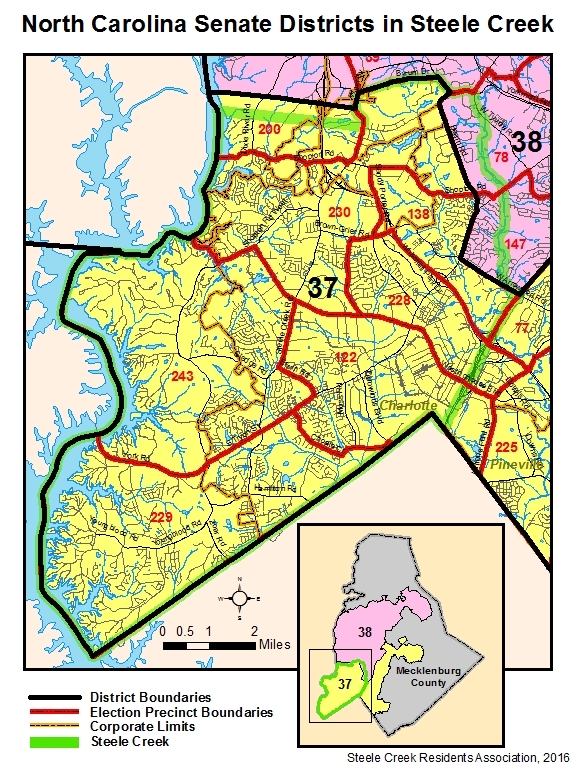 Most of Steele Creek is House District 92, but House District 102 includes neighborhoods along S Tryon St and along the Westinghouse Blvd corridor. The former representative for District 92, Charles Jeter, resigned this summer and was replaced by Justin Moore, who is not a candidate in the 2016 election. Becky Carney is running unopposed in District 102. Federal Courts have ruled the North Carolina House Districts unconstitutional, and they must be redrawn for the 2018 Election. Four candidates are running for the three at-large seats on the County Commission. Steele Creek is split between Districts 2 and 6. Incumbent candidates in those districts are running unopposed. To check your registration, view your sample ballot, and see other 2016 election information, visit the Mecklenburg County Board of Elections or North Carolina State Board of Elections web sites.